Brian had my number and I bet he has yours! In difficult times inspiration can come from the most unexpected places. I passed him on my street as I was driving home. I noticed him because not many people choose to sit in the sun on the crash barrier in the centre of the road. It was almost like he was waiting for me. He knocked quietly, as inspiration often does, and called out a quick hello. He was a local man, he said, who had lost his job a year or two back. He had seen a need in the community and was walking door to door offering to take care of it in return for the community doing a little to take care of him. 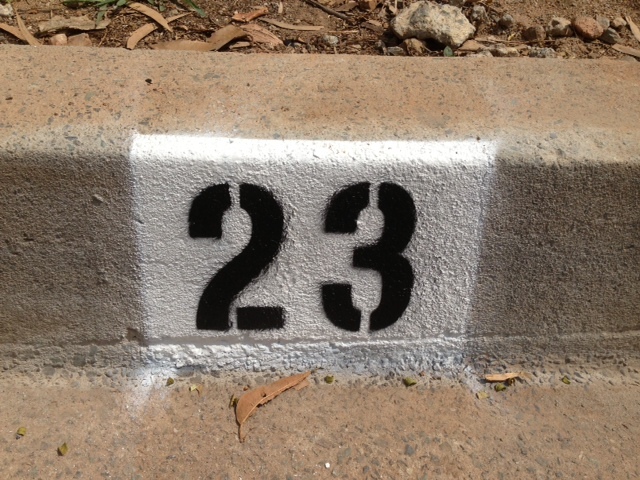 House numbers painted on the curb he said. Always a problem for ambulances, taxis and friends to find the right house at night! Would I be interested in him taking care of that for me today? The $20 he asked in return would help him to get by. I went out to watch him do his work and Brian and I got to talking. The first months were the hardest he said. Nobody wants to hire a guy in his 60’s. So he hired himself and he was getting by. Was I interested in high pressure water cleaning? He was expanding his empire, he actually said “his empire”, and was adding a guy who used to do roofing to do some of the water blasting. I know Brian is right. He did a great job and I gladly gave him some of mine. Brian had my number and I bet he has yours. If he drops by your place one day, be sure to talk to him while he is working. The inspiration is no extra charge. ← it is always funny until somebody gets hurt … in context.